Is your preschooler lost while his older brothers and sisters are being schooled? Does he long to be part of the group and have his own workbooks, too? 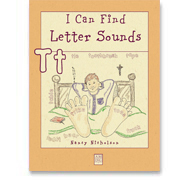 Satisfy his hunger with I Can Find Letter Sounds! This ‘ready for learning’ pre-writing workbook familiarizes the Pre-K child with simple letter shape and sound recognition, and following simple instructions. This workbook uses a ‘living learning’ approach that requires little parental involvement, yet goes beyond the workbook into hands-on activities that occupy the child. Tour this title within the Preschool Interactive Guide!